So, Gallo got busy. Working with the Office of Sustainability, he developed a comprehensive plan to capture and compost almost 100 percent of biodegradable waste on campus. The effort, collaborating with the grounds department, dining, housing and campus events, involved converting all to-go ware to compostable, post-consumer products. 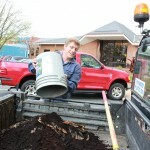 “Through his position as the student compost intern, Ian is personally responsible for ensuring the compositing of all 30,000 pounds of our campus food waste,” said David Foster, professor of biology and environmental science. Gallo also managed the Grantham Community Garden, redesigning it from a hobby plot to a production-oriented garden that sells produce to students, staff and the community at weekly farm stands. Unsold vegetables are purchased by Lottie Nelson Dining Hall. Anything left over is composted, in a continuation of the nutrient cycle. Gallo will spend the summer pursuing his passion for sustainable agriculture at Au Sable Institute of Environmental Studies as the recipient of the $5,400 Calvin B. DeWitt Leadership Fellowship scholarship. He will take several summer classes at Au Sable and then move to Pittsburgh with his family. Story by Adela Antal ’16. Photographs by Joanna Benner `17. This entry was posted on Tuesday, May 27th, 2014 at 2:45 pm	and is filed under Alumni, Sustainability. You can follow any responses to this entry through the RSS 2.0 feed. Both comments and pings are currently closed.